The controversial invitation for Netanyahu has rankled the White House. camera (Mandel Ngan/AP Photo) Vice President Joe Biden, left, and Speaker of the House John Boehner wait for the start of the State of the Union address by President Barack Obama, Jan. 20, 2015, in the House Chamber of the Capitol in Washington. A diplomatic rift between the Obama administration and Israel over Prime Minister Benjamin Netanyahu’s speech before Congress next month may be getting deeper. Vice President Joe Biden, who as president of the U.S. Senate would customarily preside over a joint session on Capitol Hill, has announced that he will not attend the speech. His office confirmed to ABC News that he will be “traveling abroad,” but it wouldn’t say why or where. The absence could give cover to other Democrats who have contemplated boycotting the speech. Republican House Speaker John Boehner, R-Ohio, invited Netanyahu without consulting with the White House, a violation of protocol that rankled the administration and its allies. The Israeli prime minister, who is in the midst of an election campaign, is likely to use the platform to burnish his image at home and rally American opposition to an Iran nuclear deal. 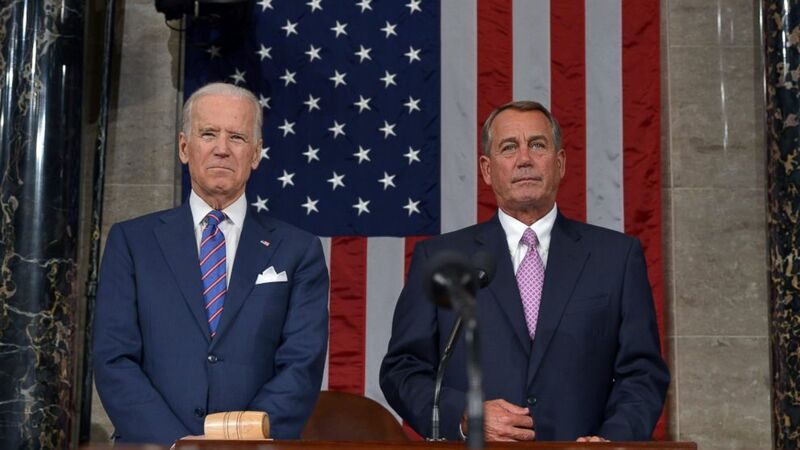 A spokesman for Boehner declined to comment on Biden's planned absence. The news comes just days after the White House seemed to suggest that Biden would likely be at the speech. He has only missed one joint session of Congress since 2009 -– a 2011 appearance by Australian Prime Minister Julia Gillard -- because he was traveling overseas. On Thursday, Earnest said he “would anticipate” that Biden would attend a speech by Pope Francis before Congress in September, but he stopped short of saying he’d “anticipate” attendance for Netanyahu. “The vice president’s schedule for the first week of March is also not yet set,” he said. Greater clarity was apparently achieved in a matter of 24 hours. Netanyahu is slated to speak on Tuesday, March 3.